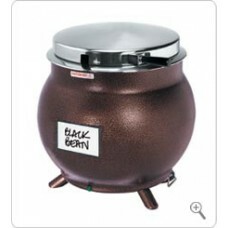 Kettle Server KS 11-Qt (copper finish) is a soup warmer/server in the traditional kettle shape. It includes five double-sided soup flavor cards for merchandising your product. 11-qt. (10.4 L) capacity. 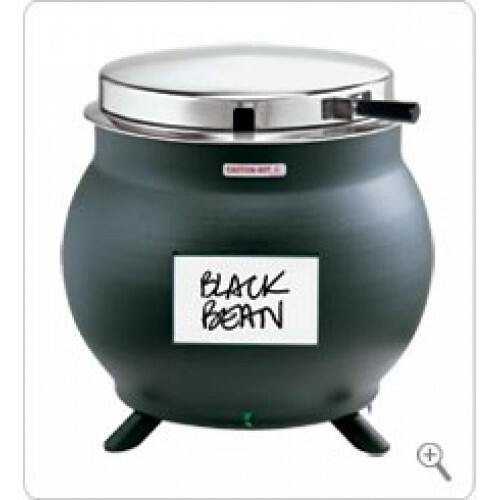 Our soup kettle is ideal for salad bars, buffet lines and self-serve operations. It's constructed of an easy to clean aluminum with a durable, epoxy coating. The unit has a stainless steel water vessel and a stainless steel food inset. KS Kettle Server features an adjustable thermostat, with degree markings, exclusive hinged lid construction, and a water bath design to keep your product at the perfect serving temperature. The adjustable real thermostat actually senses food temperature and turns the heating element on or off as needed. This unit has passed NSF's Rethermalization test. NSF, CSA, UL, NSF Retherm.